Follow the clues to uncover the next ‘hot’ ShareLunker-filled lake. Fishing lakes, like dormant volcanoes and bad boxers, sometimes telegraph their next move, if you know how to read the signs. O.H. Ivie Reservoir is a case in point. During the 2009–10 Toyota ShareLunker season, a remarkable 11 fish weighing 13 pounds or more from O.H. Ivie were entered into the program, including a new lake record 16.08-pounder that was caught on the last day of the ShareLunker season. Perhaps the most amazing catch from O.H. Ivie also came on the last day of the season. Wesley Pullig was at the lake to release a ShareLunker he caught in January and decided to do a little fishing as well. He wound up catching the final fish entered into the program last season and joined a very small club of anglers who have caught more than one ShareLunker in a single season. 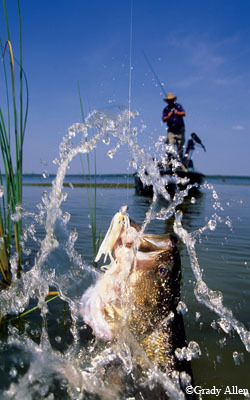 The program encourages anglers to lend or donate big bass to the Texas Parks and Wildlife Department for spawning purposes. It might seem that no one could have predicted the explosion of big fish coming from the reservoir east of San Angelo, but there were clues. It takes a perfect storm to set a lake on fire. It also takes time, and therein lies another clue to Ivie’s sudden ascension into the ranks of top big bass lakes in Texas. It’s known that most ShareLunkers are between 8 and 10 years old. It’s also known that some fish grow faster than others. O.H. Ivie was impounded in 1990 and stocked soon after with Florida largemouth bass, which grow bigger than native northern largemouths. “What is commonly known as the ‘new lake phenomenon’ resulted in three ShareLunkers in 2000 and two in 2002,” Farooqi says. When a lake is producing lots of fish and anglers are not taking many of them home to eat, a lake can become overstocked with small fish, food supplies can fall short, and fish won’t grow as fast or as big, a condition known as stockpiling. This appears to have happened at O.H. 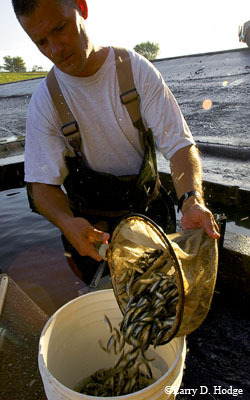 Ivie, where the harvesting of bass less than 18 inches was not allowed until a regulation change in 2001. Data from the Permian Basin Oilman’s Bass Invitational from 2003 through 2005 showed that the average weight per fish declined. That trend reversed the following year, and the six largest fish recorded each year got heavier. “We hoped the increased size of bass being caught would lead to anglers catching more trophy bass,” Farooqi says. Did it? In the Toyota ShareLunker season just past, O.H. Ivie’s 11 entries were the second-highest from one lake in the 24-year history of the program. Only the big-bass mecca of Lake Fork has produced more in a single season. Other lakes besides Ivie have also gone on ShareLunker streaks, and a look at the record of catches reveals some tell-tale signs. Ivie’s 2010 run was preceded by ShareLunkers caught in 2000 and 2002, which proved the lake could produce big fish under the right conditions. Perhaps the closest parallel to Ivie is Lake Alan Henry, near Lubbock. First impounded in 1993, and stocked with pure Florida largemouths, it produced its first two ShareLunkers only seven years later. In 2002 it produced one; in 2004, two more. Like O.H. Ivie in 2000 and 2002, a pattern was developing — the volcano was rumbling. The first eruption came in 2005, when the lake spit out nine ShareLunkers, a feat it matched the following year before cooling down to two in 2007 and none since. Some East Texas reservoirs have followed a similar pattern. Sam Rayburn Reservoir had two ShareLunkers in 1993 and again in 1994, three in each of the years 1995 and 1996, and two in 1997. Then came 1998, and the ShareLunker truck made six runs to the lake. Choke Canyon Reservoir has a similar history: one 13-pound-plus bass in 1990, two in 1993, one in 2005 and two in 2007, followed by six in 2009 and one in 2010. As with O.H. Ivie, fluctuating water levels appear to have played a major role. Two border lakes with extreme water level fluctuations also send ShareLunkers to Athens on a sporadic basis. Amistad International Reservoir produced its first ShareLunker in 1990, another in 2000, and four during the 2005-2006 ShareLunker season, including the current lake record of 15.68 pounds. Only one entry was produced in 2007 and one in 2008, but 2010 again saw four. Falcon Reservoir, with water levels that swing even more widely than Amistad’s, has had very uneven ShareLunker production despite having the reputation of being loaded with big bass. However, the stars may be aligning for Falcon. The lake has produced at least one ShareLunker in each of the last three seasons. Water levels are currently high and may be likely to remain that way for a while since Amistad, upstream from Falcon, is above its conservation pool level, the specified level dedicated to water storage. (On a personal note, on a recent trip to our hunting lease on the upper end of Amistad, my wife and I picked firewood out of trees along the shoreline where the wood had lodged four feet off the ground.) Maybe — just maybe — a perfect storm is brewing on the border. What Farooqi does not mention is that there are probably at least 11 ShareLunkers in O.H. Ivie — the ones that were caught last season were all returned to the lake alive. All ShareLunkers have a passive integrated transponder (a PIT tag) injected, and any that are recaught can be identified. One fish from Alan Henry was caught three years in a row. Fish lightning can strike more than once in the same place. Anglers hoping to catch a ShareLunker this season have a problem that’s nice to have: deciding where they will have the best chance of landing that fish of a lifetime. Sixty-one public lakes and 21 private ones have now produced ShareLunkers. The big-bass bonanza is a moveable feast, and while Lake Fork is always a good bet, it pays to keep your ear to the ground and listen for that distant rumble that may warn of an impending eruption of monster bass. O.H. Ivie’s production of 11 Toyota ShareLunkers in a single season is made more remarkable by the fact that only Lake Fork has produced that many big fish in a single season. Fork’s record will probably never be equaled: It produced 11 or more ShareLunkers eight times, including an incredible 21 between Jan. 8 and April 25, 1992. “My partner and I had been fishing all day with no luck, and we had about decided to call it a day. But I had broken off a fish early in the day, so I told my buddy we should try that spot again. He was fishing a Norman DD-22 and was not getting a bite, so I took off the worm I was fishing with and tied his DD-22 on. On the seventh or eighth cast I felt something and thought I had hit a rock on the bottom, so I stopped reeling and let the bait sit. Then the bait started swimming off, and I set the hook. “Today I met with Texas Parks and Wildlife staff and put the fish I caught in January back into the lake. This afternoon I went back out fishing and wound up catching another one, a 13.24. “She gave me no fight. She wrapped me up in a tree, came out around the limb and came straight to the boat. It was over in 30 seconds. “I was Texas-rigging with a Zoom Brush Hog on a flat with a break on it. It’s a good spawning area for this lake; we’ve caught a lot of good fish off it. She didn’t hit it too hard, just kind of picked it up. “I think everybody that does much fishing realizes that the fishing on O.H. Ivie this year has greatly exceeded anything in the past, except when it was new. The first two or three years when the lake was new, it was awesome. The last two or three years the lake has really produced a lot of good fish. I think a lot of that is because of what y’all do. Spawning fish out, bringing fish back, putting them back into the lake — it’s quite a deal, and the bass fishermen, they all appreciate it. They really do. “I didn’t have a lot of luck until the last cast of the day. I guess she was sitting in the top of a tree. She put up a real good fight. She swam out to deep water instead of into the tree and pulled drag several times. No. 500 generated more than the usual amount of interest because the angler catching it received $500 per pound from the Texas Parks and Wildlife Foundation. Callaway was fishing in the Permian Basin Oilman’s Bass Invitational tournament, which benefits the Make-a-Wish Foundation, and it didn’t take him long to decide what to do with the $6,670 he received for catching the fish. Callaway’s winnings paid for a fishing trip on O.H. Ivie in June 2010 for a number of Make-a-Wish kids, and one of them caught — no lie — a fish even bigger than Callaway’s, a bass that weighed 14.87 pounds.Callaway’s winnings paid for a fishing trip on O.H. Ivie in June 2010 for a number of Make-a-Wish kids, and one of them caught — no lie — a fish even bigger than Callaway’s, a bass that weighed 14.87 pounds. “When we came to weigh the fish, we got mixed up about which livewell it was in, and I grabbed the wrong fish. We weighed it, and it was 10.53 or something like that, and I thought the scale was a little off. We started back to the lake, and my friend Mike Davis realized we’d weighed the wrong fish. Bales’ fish is the current lake record for O.H. Ivie and the 19th largest bass ever reported caught in Texas. It was his first time to fish O.H. Ivie.